Grape phylloxera (Daktulosphaira vitifoliae (Fitch 1855); family Phylloxeridae); originally described in France as Phylloxera vastatrix; equated to the previously described Daktulosphaira vitifoliae, Phylloxera vitifoliae; commonly just called phylloxera (/fɪˈlɒksərə/; from Greek φύλλον, leaf, and ξερόν, dry) is a pest of commercial grapevines worldwide, originally native to eastern North America. These almost microscopic, pale yellow sap-sucking insects, related to aphids, feed on the roots and leaves of grapevines (depending on the phylloxera genetic strain). On Vitis vinifera L., the resulting deformations on roots ("nodosities" and "tuberosities") and secondary fungal infections can girdle roots, gradually cutting off the flow of nutrients and water to the vine. Nymphs also form protective galls on the undersides of grapevine leaves of some Vitis species and overwinter under the bark or on the vine roots; these leaf galls are typically only found on the leaves of American vines. American vine species (such as Vitis labrusca) have evolved to have several natural defenses against phylloxera. The roots of the American vines exude a sticky sap that repels the nymph form when it tries to feed from the vine by clogging its mouth. If the nymph is successful in creating a feeding wound on the root, American vines respond by forming a protective layer of tissue to cover the wound and protect it from secondary bacterial or fungal infections. Currently there is no cure for phylloxera and unlike other grape diseases such as powdery or downy mildew, there is no chemical control or response. The only successful means of controlling phylloxera has been the grafting of phylloxera resistant American rootstock (usually hybrid varieties created from the Vitis berlandieri, Vitis riparia and Vitis rupestris species) to more susceptible European vinifera vines. 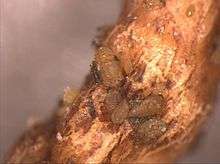 Phylloxera nymphs feeding on the roots. 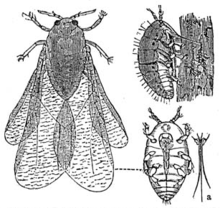 The phylloxera aphid has a complex life-cycle of up to 18 stages, that can be divided into four principal forms: sexual form, leaf form, root form, and winged form. The sexual form begins with male and female eggs laid on the underside of young grape leaves. The male and female at this stage lack a digestive system, and once hatched, they mate and then die. Before the female dies, she lays one winter egg in the bark of the vine's trunk. This egg develops into the leaf form. This nymph, the fundatrix (stem mother), climbs onto a leaf and lays eggs parthenogenetically in a leaf gall that she creates by injecting saliva into the leaf. The nymphs that hatch from these eggs may move to other leaves, or move to the roots where they begin new infections in the root form. In this form they perforate the root to find nourishment, infecting the root with a poisonous secretion that stops it from healing. This poison eventually kills the vine. This nymph reproduces by laying eggs for up to seven more generations (which also can reproduce parthenogenetically) each summer. These offspring spread to other roots of the vine, or to the roots of other vines through cracks in the soil. The generation of nymphs that hatch in the autumn hibernate in the roots and emerge next spring when the sap begins to rise. In humid areas, the nymphs develop into the winged form, else they perform the same role without wings. These nymphs start the cycle again by either staying on the vine to lay male and female eggs on the bottom side of young grape leaves, or flying to an uninfected vine to do the same. Phylloxera eggs inside a leaf gall. Many attempts have been made to interrupt this life cycle to eradicate phylloxera, but the louse has proven to be extremely adaptable, as no one stage of the life cycle is solely dependent upon another for the propagation of the species. 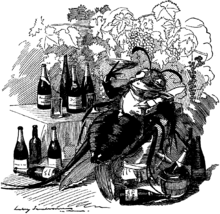 In the late 19th century the phylloxera epidemic destroyed most of the vineyards for wine grapes in Europe, most notably in France. Phylloxera was introduced to Europe when avid botanists in Victorian England collected specimens of American vines in the 1850s. Because phylloxera is native to North America, the native grape species are at least partially resistant. By contrast, the European wine grape Vitis vinifera is very susceptible to the insect. The epidemic devastated vineyards in Britain and then moved to the European mainland, destroying most of the European grape growing industry. In 1863, the first vines began to deteriorate inexplicably in the southern Rhône region of France. The problem spread rapidly across the continent. In France alone, total wine production fell from 84.5 million hectolitres in 1875 to only 23.4 million hectolitres in 1889. Some estimates hold that between two-thirds and nine-tenths of all European vineyards were destroyed. In France, one of the desperate measures of grape growers was to bury a live toad under each vine to draw out the "poison". Areas with soils composed principally of sand or schist were spared, and the spread was slowed in dry climates, but gradually the aphid spread across the continent. A significant amount of research was devoted to finding a solution to the phylloxera problem, and two major solutions gradually emerged: grafting cuttings onto resistant rootstocks and hybridization. François Baco, creator of Baco blanc, was one of many grape breeders to introduce hybrid wine grape varieties in response to the phylloxera epidemic. By the end of the 19th Century, hybridization became a popular avenue of research for stopping the phylloxera louse. 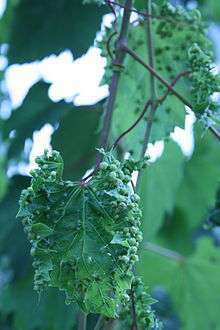 Hybridization is the breeding of Vitis vinifera with resistant species. Most native American grapes are naturally phylloxera resistant (Vitis aestivalis, rupestris, and riparia are particularly so, while Vitis labrusca has a somewhat weak resistance to it) but have aromas that are off-putting to palates accustomed to European grapes. The intent of the cross was to generate a hybrid vine that was resistant to phylloxera but produced wine that did not taste like the American grape. Ironically, the hybrids tend not to be especially resistant to phylloxera, although they are much more hardy with respect to climate and other vine diseases. The new hybrid varieties have never gained the popularity of the traditional ones. In the EU they are generally banned or at least strongly discouraged from use in quality wine, although they are still in widespread use in much of North America, such as Missouri, Ontario, and upstate New York. A grape leaf showing the galls that are formed during a phylloxera infestation. Use of a resistant, or tolerant, rootstock, developed by Charles Valentine Riley in collaboration with J. E. Planchon and promoted by T. V. Munson, involved grafting a Vitis vinifera scion onto the roots of a resistant Vitis aestivalis or other American native species. 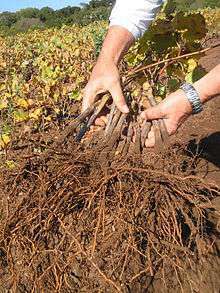 This is the preferred method today, because the rootstock does not interfere with the development of the wine grapes (more technically, the genes responsible for the grapes are not in the rootstock but in the scion), and it furthermore allows the customization of the rootstock to soil and weather conditions, as well as desired vigor. 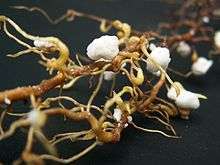 Not all rootstocks are equally resistant. Between the 1960s and the 1980s in California, many growers used a rootstock called AxR1. Even though it had already failed in many parts of the world by the early twentieth century, it was thought to be resistant by growers in California. Although phylloxera initially did not feed heavily on AxR1 roots, within twenty years, mutation and selective pressures within the phylloxera population began to overcome this rootstock, resulting in the eventual failure of most vineyards planted on AxR1. The replanting of afflicted vineyards continues today. Many have suggested that this failure was predictable, as one parent of AxR1 is in fact a susceptible V. vinifera cultivar. But the transmission of phylloxera tolerance is more complex, as is demonstrated by the continued success of 41B, an F1 hybrid of Vitis berlandieri and Vitis vinifera. The full story of the planting of AxR1 in California, its recommendation, the warnings, financial consequences, and subsequent recriminations remains to be told. Modern phylloxera infestation also occurs when wineries are in need of fruit immediately, and choose to plant ungrafted vines rather than wait for grafted vines to be available. Roots that have been damaged by phylloxera. The use of resistant American rootstock to guard against phylloxera also brought about a debate that remains unsettled to this day: whether self-rooted vines produce better wine than those that are grafted. Of course, the argument is essentially irrelevant wherever phylloxera exists. Had American rootstock not been available and used, there would be no V. vinifera wine industry in Europe or most places other than Chile, Washington State, and most of Australia. Cyprus was spared by the phylloxera plague, and thus its wine stock has not been grafted for phylloxera resistant purposes. 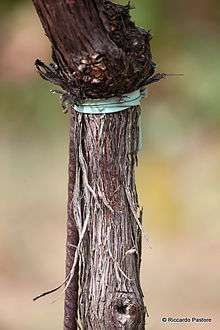 A grafted vine with the scion (grape variety) visible as the darker wood above the graft union and the rootstock variety below. The only European grapes that are natively resistant to phylloxera are the Assyrtiko grape which grows on the volcanic island of Santorini, Greece, although it is not clear whether the resistance is due to the rootstock itself or the volcanic ash on which it grows; and the Juan Garcia grape variety, autochthonous to the medieval village of Fermoselle in Spain. The Juan Garcia variety remained—untouched by phylloxera—sheltered on the vineyards planted on the man-made land terraces along the mountainous skirts on the gigantic and steep Arribes River Canyon, where the microclimatic conditions discourage the growth of phylloxera. To escape the threat of phylloxera, wines have been produced since 1979 on the sandy beaches of Provence’s Bouches-du-Rhône, which extends from the coastline of the Gard region to the waterfront village of Saintes Maries de la Mer. The sand, sun and wind in this area has been a major deterrent to phylloxera. The wine produced here is called "Vins des Sables" or "wines of the sands". In the same department, where the canal irrigation system built by the Romans still partly persists to this day, winter flooding is also practiced where possible, for instance south of the city of Tarascon. Flooding the vineyards for 50 days kills all the nymphs that overwinter in the roots or the bark at the bottom of the plant. Some regions were so blighted by phylloxera that they never recovered, and instead the producers switched crops entirely. The island of Mallorca is one example, where almonds now substitute for vines. A collection of vines with grafted rootstocks. According to wine critic and author Kerin O'Keefe, thanks to tiny parcels of vineyards throughout Europe which were inexplicably unscathed, some vineyards still exist as they were before the phylloxera devastation. So far, Chilean wine has remained phylloxera free. It is isolated from the world by the Atacama Desert to the north, the Pacific Ocean to the west, and the Andes Mountains to the east. Phylloxera has also never been found in several wine-growing regions of Australia, including Western Australia and South Australia. The Riesling of the Mosel region has also remained untouched by phylloxera; the parasite is unable to survive in the slate soil. Three tiny parcels of ungrafted Pinot noir escaped phylloxera, which is used to produce Bollinger Vieilles Vignes Françaises, one of the rarest and most expensive Champagnes available. A rare vintage port is made from ungrafted vines grown on a small parcel, called Nacional, in the heart of the Quinta do Noval estate. There is no scientific explanation as to why this plot survived while others succumbed. Another vineyard unaffected by the phylloxera is the Lisini estate in Montalcino in Italy: a half-hectare vineyard of Sangiovese, with vines dating back to the mid-1800s. Since 1985 the winery has produced a few bottles of Prefillossero (Italian for "before the phylloxera"). The wine has devout followers, including Italian wine critic Luigi Veronelli who inscribed on a bottle of the 1987 at the winery that drinking Prefillossero was like listening to ‘the earth singing to the sky’. Jumilla in southeastern Spain is an important area of ungrafted vineyards, mainly from Monastrell grapes. Those vineyards, however, are not immune to the louse, which is slowly advancing and destroying the fabled Pie Franco vineyard of the Casa Castillo estate, planted in 1942, i.e., when phylloxera had already been in the region for five decades. Large swaths of vineyards on the slopes of Sicily's volcano Mount Etna also remain free of the phylloxera louse. Some vines are more than one-hundred-fifty years old, pre-dating the phylloxera infestation in Sicily (1879–1880). Part of the reason for this is the high concentration of silica sand and very low (less than 3%) concentration of clay in the volcanic soils. In this environment (> 400m AMSL) the surface water from heavy bouts of rain seals the soil so perfectly that it imprisons the louse, effectively drowning them before they are able to thrive. ↑ McLeod, Murdick J.; Williams, Roger N. "Grape Phylloxera". Archived from the original on 2012-07-16. 1 2 winepros.com.au The Oxford Companion to Wine. "phylloxera". ↑ "Wines of the Sand". Feature Article. Novus Vinum. 2006-09-17. Retrieved 2008-11-05. ↑ G. Gale. "Saving the vine from phylloxera: a never-ending battle" (PDF). University of Missouri-Kansas City. 1 2 3 4 O'Keefe, Kerin (October 2005). "The great escape". Decanter. ↑ "Phylloxera". Vinehealth Australia. Retrieved 3 May 2016. ↑ Pigott, Stuart. "The Mosel River Renaissance". Los Angeles Times. Retrieved 3 May 2016. ↑ Salcito, Jordan. "Germany's Wine Revolution Is Just Getting Started". The Daily Beast. Retrieved 3 May 2016. Boubals, Denis, "Sur les attaques de Phylloxera des racines dans le monde", Progres Agricole et Viticole, Montpellier, 110:416-421, 1993. Campbell, Christy, "The Botanist and the Vintner: How Wine Was Saved for the World", Algonquin Books, 2005. Ordish, George, "The Great Wine Blight", Pan Macmillan, 1987. Powell, Kevin, "Grape phylloxera: An Overview". In Root feeders An Ecosystem perspective (Eds S.N. Johnson & P.J. Murray) CAB International 2008.